The Italian shipyard Mariotti, based in Genoa, will undertake major refit and maintenance work on the 60 metre superyacht* Andreas L* and 54 metre Rahil. A spokesman for the company said the contracts marked the shipyard’s return to the yachting business. Now in the fourth generation of ownership, Mariotti has been in operation since 1928 as a well-regarded ship repair yard and builder. In 2010, Mariotti launched Mariotti Yachts, with an investment of more than €9 million for facilities and plants to support the new brand. Delivered by Mariotti in 2012, Rahil is returning to the Mariotti yard for service. 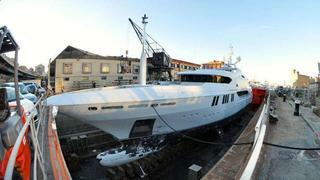 Rahil was the second 53.8 metre motor yacht delivered by Mariotti Yachts. Designed by Luca Dini, she’s very similar to her sistership, Sea Force One, launched in 2008. She will be dry docked during second half of February, and the work undertaken will include hull cleaning and painting, replacement of the sacrificial anodes, maintenance of the tail shafts and rudders, overhauling the through-hull fittings and ensuring all engine piping is up to standard. Currently for sale, Andreas L is a Benetti and a highly successful purpose-built charter yacht, carrying the latest audiovisual and communications systems, along with a vast array of watersports equipment, a fully-equipped gymnasium and a dedicated massage room. Andreas L can accommodate 12 guests in one master stateroom, one VIP and two double cabins and two twin cabins. The tri-deck yacht, built in 2008, will have the same work completed as Rahil, as well as the renewal of one stainless steel tank for emergency generator cooling.